Dartmouth Alumni Relations provides meaningful engagement opportunities for all Dartmouth Alumni to be involved with the institution and connected to each other. Dartmouth graduates maintain an especially robust relationship with their alma mater. Alumni devote an extraordinary amount of time and talent to the institution, and Dartmouth’s relationship with its alumni is highly regarded in the world of higher education. Today, nearly 250 years after the founding of Dartmouth, alumni remain as engaged and connected to the College as ever. 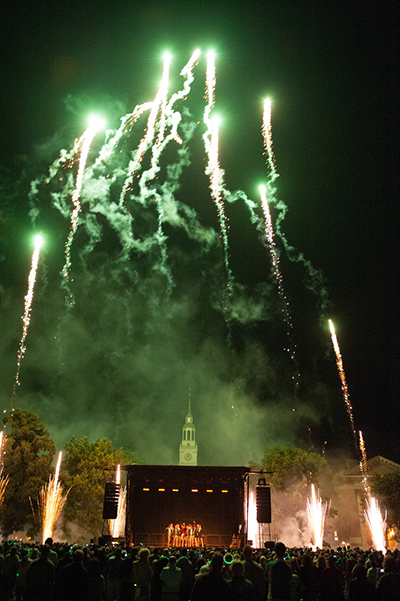 More than 4,000 alumni come “home” for Reunions every June, and thousands return to share in the warmth and camaraderie of Dartmouth Night and Homecoming, held every fall since 1895. Across the globe, alumni also network and maintain their connections with the College through their classes—73 of them—and through nearly 100 geographical clubs and affiliated and shared interest groups. Volunteer leaders serve an especially important role at Dartmouth through organizations such as the Alumni Council and the Association of Alumni. Alumni interview prospective students; help solicit gifts for the Dartmouth College Fund; provide career advice and mentor young professionals; and cheer on the Big Green athletic teams. Many alumni also take advantage of our global educational programming through Dartmouth on Location and the Dartmouth Alumni Travel program. We hope this website provides a glimpse of the many ways you can stay engaged with Dartmouth. If your question isn’t answered here, please contact our staff. Note: Some alumni have dual degrees, i.e. an undergraduate and a Tuck degree, so the number of degrees from each institution does not equal the total number. These numbers were modified on October 2017.